The last thing I expected to feel in Fallout 4 was civic pride. Games by Bethesda, vital as they are, can be cold and alienating—monoliths of content populated by awkward, dead-eyed automatons. They’re sandboxes ready to be manipulated and mined to the player’s whims, offering little reason to consider the chaos that your selfish meddling introduces to the lives of unsuspecting inhabitants. You can play the virtuous hero and avoid ugliness or take on traveling companions, but in the end, it’s you versus the world, and the world doesn’t stand a chance. That’s all true of Fallout 4, too. As always, it’s up to you to direct your story and manage conflict. You could tear through this vision of a post-nuke Massachusetts as a hardened adventurer out for yourself, hunting the bastards who wronged you without regard for the people you meet along the way. But Fallout 4 makes an appeal to our sense of community and belonging. It shows you the life your character once had—a family and a futuristic suburban home decked out in the chrome and pastels of the 1950s, long the series’ anachronistic aesthetic of choice—and rips all of it away, as you shuffle into a high-tech bunker while the world undergoes nuclear armageddon. What starts as the most familiar and welcoming of recent Bethesda games becomes the most tragic and lonely. You’re left with a pistol and a vendetta, as usual. The difference this time is that Fallout 4 provides all the tools and reasons to rebuild, to make a new life with a place and people you call your own. Those themes of family and community drive the game and its characters. The major settlements make up for their small size with personality and spirit. Diamond City, a neon-tinged shantytown inside the fortified walls of Fenway Park, is packed with strange characters and relies on the comforting familiarity of classism. Its cooler, more dangerous cousin, Goodneighbor, is a haven for the criminals and misfits who Diamond City deems unfit to live behind its big green wall. Both have their fair share of memorable citizens with an infectious, unwavering will to do right by their hometown. After getting to know them for a bit, some of those characters will agree to tag along on your adventures. The writing of the companions is where Bethesda has shown the greatest progress. Your bond tightens as you kill and pillage and protect together. Eventually they reveal intimate details of their pasts and their fears for the future. Borrowing from the Mass Effect playbook, these relationships create the feeling that you’re building a tight-knit motley crew, a reliable gang of friends who provide more than just an extra backpack to share the burden of your inventory. Along with a steady stream of effective callbacks and quiet long-term storytelling—once, I left a hotel room after a one-night stand and ran into an acquaintance from 200 years ago—the quest’s companionship goes a long way to creating a real emotional connection to The Commonwealth and its people. The rest of the world doesn’t have as much personality. The series has always leaned heavily into dark comedy and weird B-movie kitsch, and while there’s still a whiff of that here, it’s dialed back in favor of more straight-faced science fiction and film noir influences. The Commonwealth’s landscape, abandoned buildings, and other points of interest blend into a sad mélange of gray rubble, an inevitability of the post-apocalyptic setting. It falls to Fallout 4’s stories—told both explicitly and implicitly, through the details of the death-filled ruins—to liven up the place. The unique regions around the map’s outer edges and the events of the game’s grander storylines almost always satisfy, unfolding with twists and spectacle. The in-between parts, though, are often as unremarkable as the wasteland’s splintered roads—yet another apartment building full of mutants or a gas station with a mole rat problem. The thrill of discovering some unknown location is as big a draw as ever, but there’s less of a chance that you’ll be surprised by what you find. The ability to build stuff when you’re not exploring or killing is the biggest addition to the core of the game, which is otherwise nearly identical to Fallout 3. In certain places, you can set up structures and objects cobbled from all the junk you find out in the wasteland. Though you will be forced to use these crafting tools occasionally, the activity doesn’t requires much time or thought, unless you want it to. If you choose to follow the path of the junkyard architect, you can lay out every piece of a palatial shack or just pick from a handful of prefab shanties and call it a day. Everything ends up looking the same, but what do you expect from a society that’s clawing its way out of an irradiated crater? Whether you invest the time to build up a community—attracting settlers and providing them with food and protection—or move into an isolated fixer-upper on your own, the important thing is that you built these places. They become your new home, something to own and take pride in, just like the people of Goodneighbor who ardently defend their little den of iniquity. Your building sites provide invaluable bases of operation where you can collect yourself and rid your overflowing pockets of all the crap you’ve picked up. And yes, you’re going to need all that junk. You can choose to forgo the base-building projects, but your spoils are also used to improve your weapons and armor, which is a hobby worth embracing. With smart combinations of parts and special weapons found in the wastes, devastating firearms can be assembled. Junk breaks down into component materials—steel, wood, adhesive, glass, etc.—and several of these are ingredients in nearly every major upgrade, so now there’s a good reason to pick up old desk fans and aluminum cans. (Seriously, you should pick up every aluminum can you find. Thank me later.) It’s not unusual to pick out a new part for your rifle and notice you’re just one screw short of a major boost to its damage output. So off you go, rummaging through dilapidated diners and gas stations looking for that missing piece. You’re forced to scrounge for more than just ammunition and essentials, and it goes a long way to making Fallout 4 feel even more post-apocalyptic. 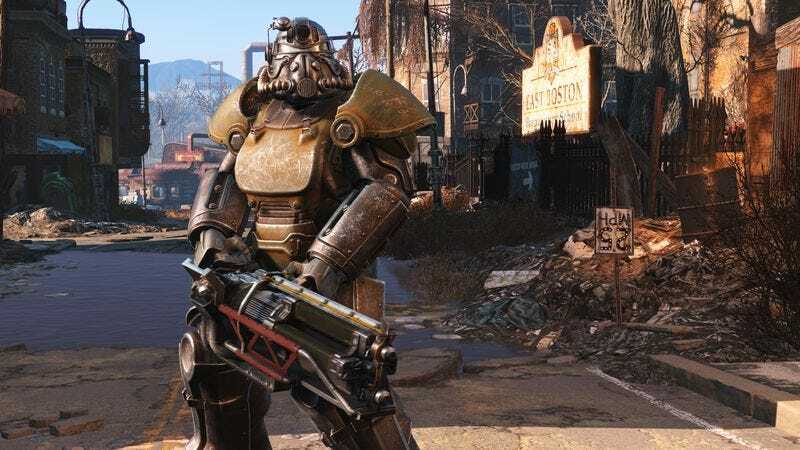 Perhaps because of that emphasis on gun-smithing, and the fact that you no longer have to worry about your gear breaking down from overuse, Bethesda doubles down on shooting. VATS, the technology that formerly allowed you to stop time and pick your targets, now just slows time. So enemies that attack head-on—wild animals, giants mutants with sledgehammers—pose a serious threat, and armed foes can fire on you while you’re still calling your shots. Locations are often crammed with hostiles, and compared to you, anyway, they’re surprisingly accurate. Relying solely on VATS in these situations is nearly impossible, so it’s a good thing Bethesda made it easier to aim and shoot on the fly. But a desire to show off that improvement may have led to an overabundance of gunplay, the series’ least rewarding activity. In large doses, all that fighting can be tiresome, but the best thing about Fallout 4 is that it wants you to have something to fight for—more than just a vendetta, or some life-saving MacGuffin, or the player’s own bloodthirsty whims. Grizzled, score-settling lone wanderers will feel at home in The Commonwealth, but this world offers something more: a chance to rebuild, to belong to something bigger than yourself and defend it from all comers. The most you can usually hope for is “This place isn’t so bad, for a shithole,” but at least it’s your shithole.